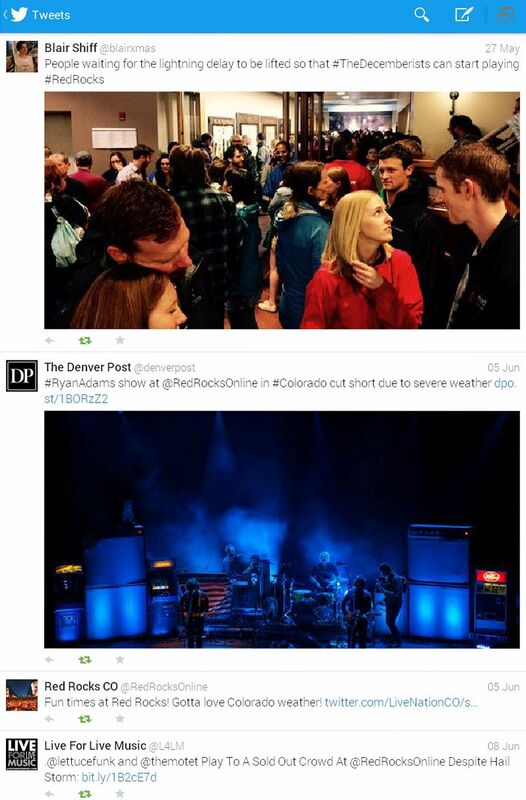 Weather has played havoc with several Red Rocks concerts this season, but these fans are not to be daunted. Although performers are protected by the stage cover, the audience in the amphitheater is pretty much exposed to whatever Mother Nature has to offer. In late May and early June, looks like she’s been pissed. This year, already a season to remember, includes an exciting buffet of lightning, rain, and hail. Our incredible streak of daily deluges did not made it easy at the world-famous venue. Read on: Does this sound like a workable emergency plan to you? Who decides? Who calls the shots on public safety? First memorable occasion, we think, was a lightning delay when Decemberists visited on May 27. 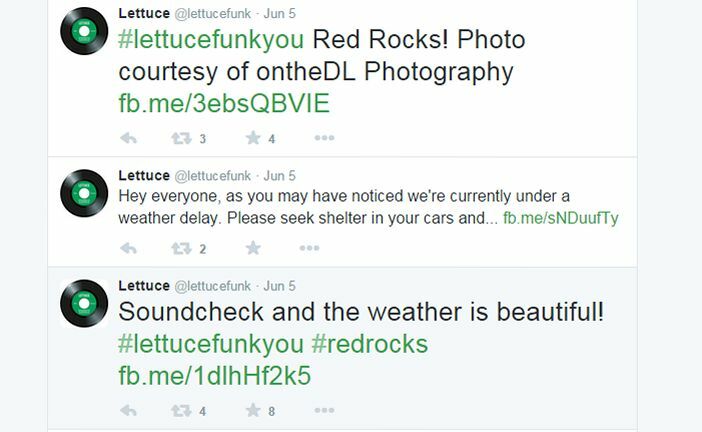 Tweets from Red Rocks management urged fans to go to the Visitors Center or return to their cars. See our previous post. The Visitor Center probably doesn’t hold 9,000 people (see image left), and it can be a long walk to the parking lots, but this is evidently the plan for emergency shelter. Lindsay Stirling fared better the following night (May 28), as she was apparently greeted only by lightning and rainbows. Old Crow Medicine Show was similarly lucky on June 3. Then on June 4, Ryan Adams made it through most of his performance before being cut a few songs short by “a blitzkrieg of lightning”; fans had a good time anyway, it seemed. The main event came June 5. Weather was great and The Motet made it through, but another delay was called, delaying headliner Lettuce Funk from taking the stage. Conditions were intense, to say the least, with lightning in the area and heavy hail and rushing water in the Amphitheater itself (don’t miss the video). We heard those who made it to the Visitor Center early stayed dry, but others were not allowed to enter. A night to remember. Tedeschi Trucks Band, on Jun 13, experienced another lightning delay, but, of course, the show must go on, and, as Westword explains, it did. Water on stage, threatening equipment, no big deal. Now you feel like you’ve been there, right? Weather has affected events at Red Rocks before, but we’d be hard pressed to find a string quite as bad as this one. Hosting more concerts every year just increases the chances of encountering rough nights. Stay tuned.